Thanksgiving in Encino is a wonderful time of year. The leaves are beginning to turn, there is a nip in the air at night that makes a fire in the fireplace seem just right and the harvest of wholesome area produce is bountiful. Area businesses are starting to deck the halls in preparation for the holidays and our mighty evergreens are more festive than ever. One of the many things that I am grateful for this year is the wonderful Encino Farmer’s Market. 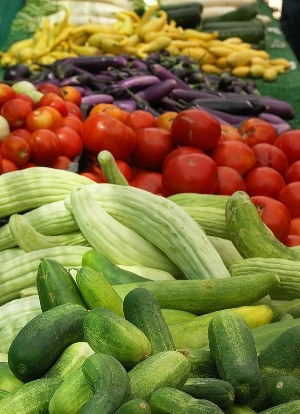 Every Sunday this open air market offers free parking at San Fernando Valley’s large certified farmer’s market. Here our residents can find the freshest herbs, vegetables, fruits, eggs and cheeses, most of them organic and offered far cheaper than can be purchased at a traditional market. I am a huge fan of the array of nuts and home baked goods that are offered at the market. They certainly make the season tastier! I am also grateful for all of the wonderful people I meet in my work as Encino’s #1 rated Realtor. It really is true that I meet the nicest and most interesting people everyday by simply doing my job. It is my unique pleasure to serve my clients in this wonderful community that I call home. I hope that this Thanksgiving finds you gathered around a toasty fire place with your loved ones enjoying the fruits of the harvest. There really is no place like home for the Holidays especially when it includes loved ones. I’m Carol Wolfe and for Real Estate in Southern California…nobody does it better.